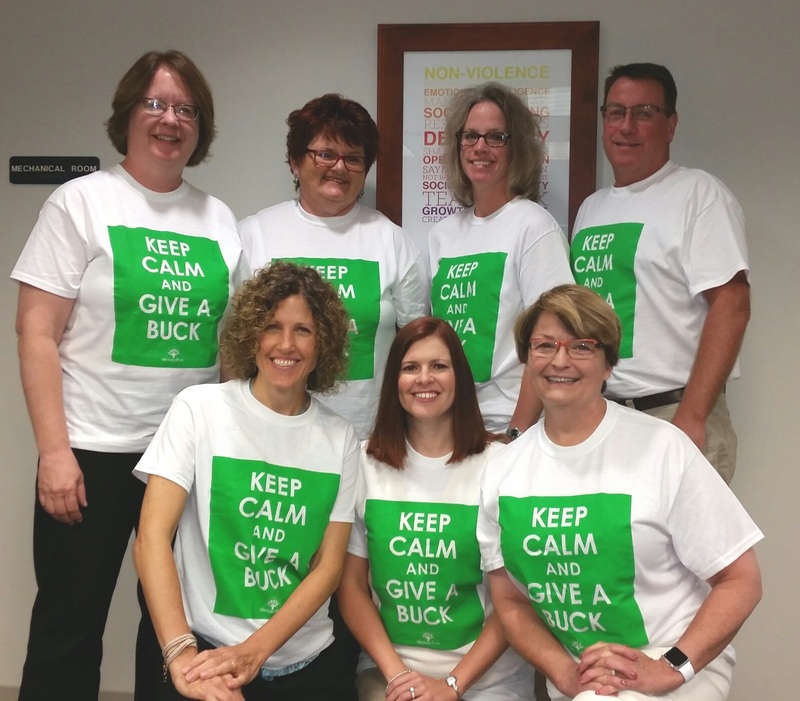 Orchard Place senior management team in “Give a Buck” t-shirts created by Broken Arrow T-Shirt Printing and Embroidery. The team raised $31,000 for United Way of Central Iowa, a 21 percent increase over the previous year. “United Way’s support helps us to reach thousands of children with mental health services who would likely otherwise not get the help they need,” says Andrea Goedderz, Orchard Place Director of Individual and Corporate Giving. Broken Arrow T-Shirt Printing and Embroidery is proud to make Custom T-shirts for Orchard Place fundraising campaigns! What does Orchard Place do? Orchard Place, Iowa’s mental health experts for children and teens, serves nearly 10,000 children and youth annually. The non-profit, charitable organization employs approximately 375 staff members and utilizes the services of over 400 volunteers. Orchard Place provides children’s services in four distinct areas: mental health, substance abuse, education, and juvenile justice. Youth mental health services include including residential, outpatient, in-home and care coordination programs. Orchard Place’s residential program provides intensive psychological and behavioral treatment for children with serious mental health disorders that make them unable to function in their homes, schools, and communities. Outpatient services include therapy, psychological assessments and testing, psychiatric assessments, and medication management. In-home and care coordination services include mental health education and assistance to parents, educators and child care professionals. Orchard Place’s Juvenile Court School-Based Liaison program operates out of schools, providing supervision to kids under court system jurisdiction or deemed at-risk by school administrators. Join an event. The Moonlight Classic Bike Ride through downtown Des Moines, this year on July 15, 2017, supports the children and programs of Orchard Place. The Holiday Gift Drive in December provides Orchard Place kids a special gift that can make their holiday season brighter. Add a giving tree to your business or church or simply buy a requested gift and donate it. The Orchard Place Spelling Bee is an annual fun, energetic, silly event held in late winter that allows the best and worst spelling teams (and bribers) have a chance at winning. Volunteer. Orchard place loves volunteers! From mentors to tutors to hobby enthusiasts willing to share their skills, Orchard Place appreciates any time you are willing to give. Donate. Charitable donations enable Orchard Place to continue providing critical services to children in need. Donate any amount, small or large, to make an immediate impact on a child’s life.